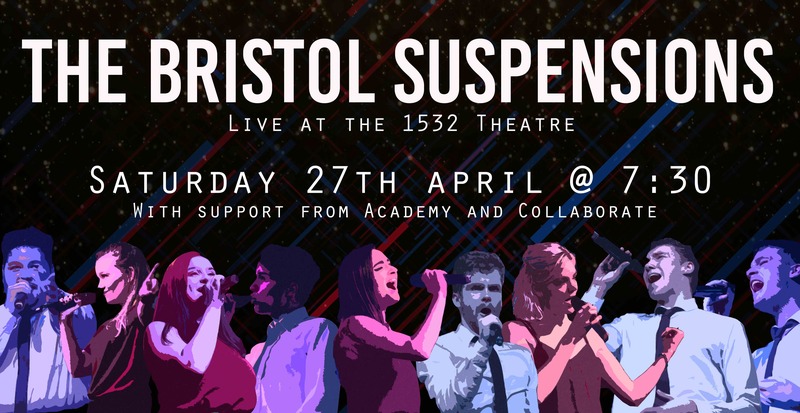 The Bristol Suspensions are back at the 1532 Theatre on Saturday 27th April for a second year running! The Bristol Suspensions are a 16-piece mixed a cappella group from the University of Bristol. Having just celebrated their fifth year, the group has had great success competitively, winning the Voice Fest UK in 2016 and running up in the 2018 and 2019 ICCA UK Final, as well as receiving various awards for best choreography, arrangement and vocal percussion! Stylistically, the Suspensions are renowned for their electric stage presence and incredibly high energy performance mixed with moments of comedy, as well as top-notch vocals. The group enjoys performing an eclectic range of musical genres. From Lianne La Havas to The Greatest Showman, watch these talented students make music using nothing but their mouths. Expect impressive beatboxing, hilarious dance moves and a pulse-pounding performance. We’re incredibly excited to announce that our show will be supported by two incredible groups. Academy, a fellow Bristol group, have had an extremely successful year, qualifying for the ICCA UK Final two years running and releasing their first music video "Bills". Their debut show with Pitch Fight at the Edinburgh fringe last summer was a hit and they are returning this summer for more of the action. Academy like to put as much energy as possible into their performances, whether that be through their cheeky choreography or through their unexpected twists on popular songs, all Academy strive to achieve is leave a smile on the audience’s faces at the end of the performance! Collaborate is a semi-professional a cappella group based in London. Founded in 2017, they are creating a platform for collaborating and producing innovative and original content. In their first year, they have hosted several sold-out concerts in London, produced an original song, and released several new music videos. As always, you can expect to hear signature arrangements performed by the group, original material, and stunning vocals. So if you enjoy singing, dancing, drama, comedy, and more than a few excellently-pitched puns, you’re going to love this show.